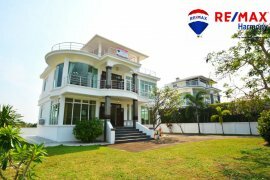 RE/MAX Harmony is the premier agency in Hua Hin featuring all Exclusive listed properties and a fantastic reputation for providing professional service with integrity and many happy clients from all over the world. The owners and their team are Dedicated, Ethical, Knowledgabel, Reliable and Professional. As being in the RE/MAX family, we are global, and recognised around the world as the # 1 property agency you go to when you want professional service. Specializing in Hua Hin, Dolphin bay and surrounding areas. With our highly trained team of professionals, including the broker/ owner and consultants, & agents from different countries and specialist in all aspects of real estate We provide our clients with an Exclusive service, including but not limited to acquiring property, from bungalows, to condos, pool villas and investment properties and commercial properties. We provide re-sales, & new BOP properties, as well as rentals, professional property management and consulting services meeting and exceeding the needs of our entire international and local clientele. Enjoy a peace of mind. Relax and call RE/MAX ! 3 Story Villa brand-new spectacular mountain and golf course view estate. SONGKRAN Special price!! !2 Bedrooms House Hua Hin. 2 Story 3 bedrooms Villa Hua Hin with private Pool. Paradise gold pool Villa Hua Hin. Cozy & Lovely Home Hau Hin Soi 6. Two story villa Hua Hin Soi 6. 2 Story Pool Villa 1 Rai of Land. The cozy 2 bedrooms Bungalow vacation Hua Hin. Sea Ridge Sea View Penthouse Condo # Hua Hin Khao Tao. Paradise Villa 3 bedrooms Hua Hin Soi 6. Boutique Hotel # 200 meters to the Khao Takeeab beach. Paradise Villa Hua Hin Soi 6. 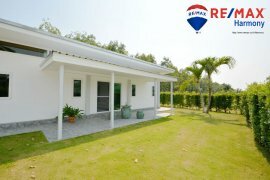 3 bedrooms house in Tropical garden Hua Hin Soi 6..